Well the rush of Christmas is over, the houseguests have gone, and I feel like I haven’t stopped cleaning in days! Christmas Eve’s bread project went over well. I had an abundance of food (fishes & loves miracle if I ever saw one), and I heard several compliments. Elijah enjoyed the music, so I think he’s ready to check out KidStuf at church. It’s a family service with singing and dancing. Christmas was a blast. Santa brought us a Wii, which everyone enjoyed. Grampy left wanting to get one fro their place! The boys got so many toys (please, none for their birthdays!!! ), and we’ve eaten so much yummy food and treats. Thankfully I’ve only put on a few pounds, so once I get back to the gym, I’ll be okay. Pictures are up on shutterfly, under Holidays 2007. We had plans to take Grampy to Boulder, as he’s never been, but the snow we got last week cancelled that. We’d have to take 2 cars there, and Gary doesn’t do so great with snow (he’s a summer car). Maybe next visit. We mostly hung out around here, and played Wii, and more Wii. The plan for New Year’s Eve is the same as always, try and stay awake! New Year’s day we’ll have a ham dinner and possibly have Kevin & Ali over. I’ve finally seen some movies I have wanted to see all year, thanks to Christmas gifts. Ratatouille and Pirates Of The Caribbean: At World’s End. Both very enjoyable. I’ll close with a quote from Ratatouille. Larousse: Oh, look who it is! Alfredo Linguini! His mother’s an old flame of Gusteau’s. Skinner: Ah, yes. How is Renata? Linguini: Oh, no, don’t be. She believed in Heaven, so she’s covered… after-life speaking. Been very busy, but will try to blog again soon. Needless to say, this Christmas has been filled with abundant blessings, family, snow, and a Wii from Santa. Thanks Kristen! Hope my other online friends will do this too. 1. Wrapping paper or gift bags? Wrapping paper & gift bags. I reuse gift bags from years past. 2. Real tree or artificial? We have one of each. I love the smell of a real tree in the house. 3. When do you put up the tree? The fake one goes up the first weekend in December. The real one maybe two weeks before Christmas. 4. When do you take the tree down? Depends on when the mood strikes me. Around New Year’s. 5. Do you like eggnog? No way Jose. 6. What about Fruitcake? Not a fan of fruit. 7. Favorite gift received as a child? Probably my doll. I had this one doll, and she was as big as me. I’d pretend she was my little sister. 8. Do you have a nativity scene? Yes, a few of them. I love them. Got one this year for the kids. 10. Easiest person to buy for? Either my kids, or Dawn. 11. Worst Christmas gift you ever received? Oh, the infamous jar of mints. 12. Mail or email Christmas cards? I love mailing Christmas cards, and I like to get them out just after Thanksgiving. 13. Favorite Christmas Movie? A Christmas Story, Elf, and The Ref. 14. When do you start shopping for Christmas? In the summer. 15. Have you ever recycled a Christmas present? No, but I should at some point. 17. Clear lights or colored on the tree? Colored, for sure. 20. Can you name all of Santa’s reindeer? Dasher, Dancer, Prancer, Vixen, Comet, Cupid, Donner, Blitzen. 22. Open the presents Christmas Eve or morning? We usually open one gift Christmas Eve, then the rest wait for the morning. Not sure we’ll do that with the boys this year. 23. What is the one present you want most this year? Don’t laugh… long underwear. Seriously. 25. What I love most about Christmas? The lights, the music, public celebrating of Christ’s birth, the excitement the kids have. It’s also the one time a year I can count on hearing hubby play his violin. This is the longest month ever! I want it to be Christmas now! Thankfully the urge to shop is gone, mostly because everything has been wrapped, and I don’t want to wrap anymore. Now I can be bothered by whether or not shipped gifts arrive on time. We’ve had a little snow come in this week (Tuesday & Friday) , and we might get a little more on Friday. Nana & Grampy arrive Thursday night. So we’re all looking forward to that. Friday night Ali & Kevin came over. Ali needed a sous-chef for her Christmas baking project. No, not me, Geoff. Let me tell you, it was pretty hard to let her leave with that treat, especially since the whole house now smelled like it. Since I don’t know if it’s a surprise to her family, I won’t say what it was publicly. Oh, also on Friday night, we had Jim ‘N Nick’s. Let me say again how much they rock! Our loyalty there has never been more rewarded. We did drive-thru, and when we got home, we discovered part of our order was missing. We did check the bag before we drove off, but all we did was count the boxes. It was snowing, and we didn’t really want to go back out in it. So I called them, thinking they’d offer to credit my credit card. Instead, they sent a chef to our door with the food, plus some extra food. And they kept apologizing. This company sure goes above & beyond let me tell you. I wish JNN were everywhere so you could all enjoy it. Yesterday we went out to get a real tree, and wow it sure looks awesome. 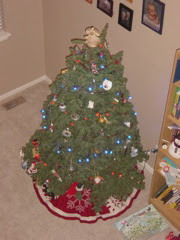 Then we decorated it (more pics are on shutterfly). Eliajh pretty much hung all the ornaments I gave him on one little section of the tree. It’s kind of cute. We have put a few presents that have come in the mail under the fake tree. Elijah has organized them by wrapping paper. I’ll close with a quote from Scrooged. Is it Christmas yet? How can an impatient woman teach her children to be patient for Christmas? I have a few stocking stuffers to pick up, one Santa gift for a little boy, and I am done. But I can’t buy that gift in the presence of his older brother, so I need to find time to get away and do it. It’s at the really cool toy store in Cherry Creek North. Took the boys to see Santa at Southlands (pic on Miles’ blog). I love that my kids aren’t the ones crying and screaming, so Santa is happy to have them come back anytime. And there was no line, which was even better. The bread adventure for church is going okay. I’m not totally worried. But check with me next week. Went to the dentist yesterday and Jane said my teeth look great. Yay! I’m gonna close with a quote from Rudolph The Red Nosed Reindeer. Yukon Cornelius: Fog’s as thick as peanut butter. Yukon Cornelius: You eat what you like and I’ll eat what I’ll like. I am warning you up front, this post is about food. So if you are hungry, don’t read it. Last night Geoff and I went out to dinner while the boys spent time with Kevin & Ali. We opted for someplace new, so we went to Ted’s Montana Grill. We thought it would be fancier than it was, nonetheless it was a very tasty meal. We both tried bison burgers. I would recommend Ted’s to someone looking for a good meal. A few weeks ago we were looking to get some lunch after shopping and tried Dickey’s Barbeque. Now you all know how we love Jim ‘N Nick’s, so we thought maybe we ought to compare. Well, a bbq lunch is pretty good, but Dickey’s had nothing on JNN. No comparison, JNN is far superior. We are happy to know our loyalty has not been in vain. I’ve undertaken the task of trying to organize people to help bake bread for Creekside’s Christmas Eve service. It’s a big job, but I am feeling encouraged by the willingness of some of the bakers, and by the support of my friends and family. If I can do a small thing like this to make Christmas Eve special, then it makes me happy. I’ll close with a quote from How The Grinch Stole Christmas. The Grinch: Blast this Christmas music. It’s joyful and triumphant. I in no way meant to slight the November birthdays, rather some of my favorite people have November birthdays. I just plum forgot. November birthday wishes went out to Chad, Kelly, Dylan, & Dawn. December birthday wishes are going out to Colin, Kirsty & Josh. If you live in Edmonton, perhaps you read about my cousin Doug in the paper. He was involved in an accident at work, where he sustained some burns. He’s okay, he has been released from the hospital, but will be off work for several weeks while he recovers. Please pray for a smooth recovery for him. Also that he will be open to my brother getting him a job at his work, which is less dangerous.